Pub-Me Content Management System has undergone an important upgrade. After all, the world of internet is developing fast and we cannot afford to rest on our laurels. What new is there for you to see? That's what this article is about. full support of responsive web has been an integral part of the system for some time already but the latest version makes mobile web even easier to create. Nothing changes for the admin, everything changes for the visitor of the website. an entirely new lightbox, or the way galleries are displayed. Browsing through images in a gallery has never been easier and more attractive. the administration interface has been unified in all aspects including icons, dialog windows, wysiwyg editor etc. a new system of dialog windows. Everything is much easier to use and we dare say also nicer. easy interconnection with social and other plugins of third parties such as facebook, twitter, Google Analytics, maps etc. upload more files at once from the administration. It is no longer necessary to use ftp to upload a lot of files. edit launguage files in the administration. Your secretary can update automatically generated texts now. 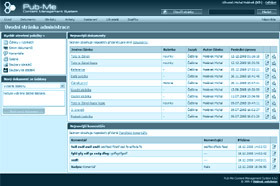 choose the looks of the administration UI. It is just a small thing but why not - choose the design you like the most. more Ajax, less reloading. If you don't have idea what we're speaking about, don't worry. You will just simply see the administration window reload less often and your work should be even more pleasant. faster and easier programming of add-ins. and much more... just ask us if we are capable of doing exactly what you need.